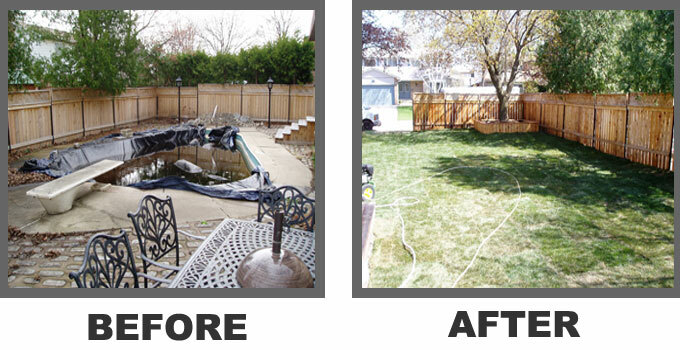 For more than three decades, we have established clients we call friends who can vouch for our professionalism in terms of servicing your in-ground pool fill in and above ground pool fill in. For this very reason, our services of pools are offered at very economical rates compared to our competitors. 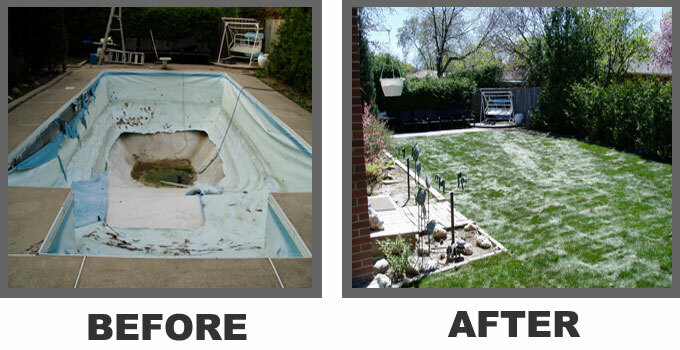 We specialize in Concrete Pool Removal (gunite-concrete), In-Ground Pools, Fiberglass Swimming Pools and Above Ground Swimming Pools. 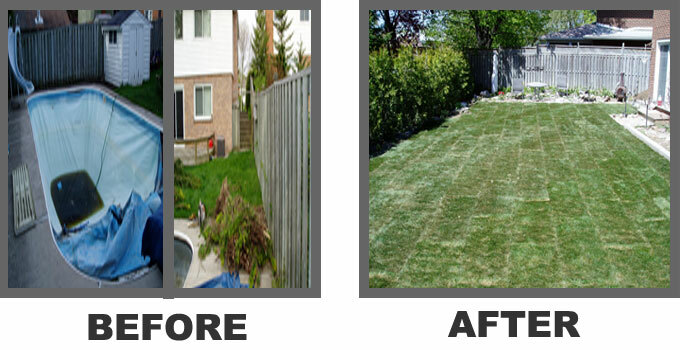 We serve areas in Newmarket, Keswick, Aurora, Sutton, Udora, Uxbridge, Stoufville, Port Perry, Markham, Scarborough, Pickering, Ajax, Whitby, Oshawa, Courtice, Richmond Hill, Thornhill, Brantford, Mississauga, Stratford, Peterborough, Brighten, Belleville, Quinte , Toronto and GTA. Jenn from Richmond Hill – When we first bought the home, it came with an inground concrete pool that we never used and had to maintain. It took up so much time and room. Not only did Michael and his team helped remove and fill the hole, they also did our landscape. He also took the time to explain the procedures and listened to how we wanted our backyard to look like with a reasonable price. Thank you so much Michael and your team! We definitely recommend him to everyone. 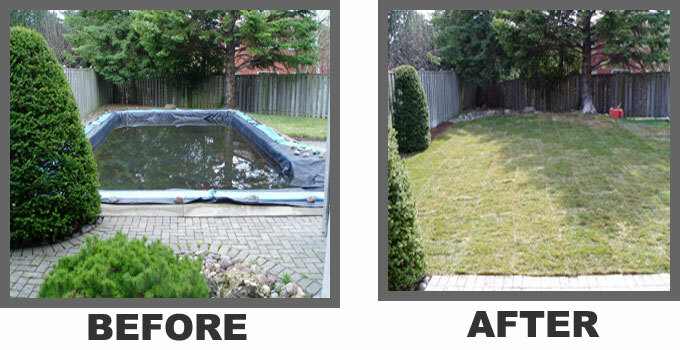 Andrea Ward from Mississauga – Tears of joy at the work Michael and team did with our new backyard. So beautiful and they did it so quickly!! In and out in two days including clean up. So happy. If you need your pool retired – check these guys out! Jim from North York – Hands down for Michael & his team! So sorry for his competitors, but this guy is by far the best in this business. So I picked a few guys , within pool removal business and they all come to visit my home, no question about that. However one guy who is doing also demolition he said that this will cost me too much because my pool is a concrete build. Another one which is doing some pool fill ins, don’t remember now the company name, but he said something about pool people … whatever, he gave me price with $3,000 more than Michael’s. Anyway, beside the price, Sure cut company shows up right in time to my house and did the job in one day !!! They cleaned everything after they are done and that’s the story. Great job, thanks again.